Yep. That's Jon Paul and Rachel. We started a tradition last year when we rang in 2007. We let Rachel stay up until midnight, if she could make it. We roasted marshmallows in the fireplace. We played games and watched the ball drop. 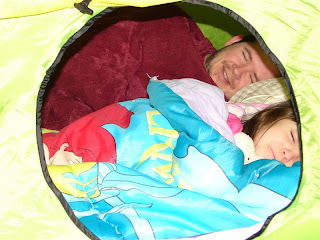 And she and her Daddy slept in the tent. Last year, we put the tent on a memory foam mattress pad. This year, the mattress pad is on our bed. For Daddy, the floor is just too hard to sleep comfortably. The solution is in the photo. sleep on and we blew up our travel air mattress for Rachel. I think that has to be the sweetest thing ever!! You've confirmed it. We're rednecks! Only ours is a playroom and a full sized tent. 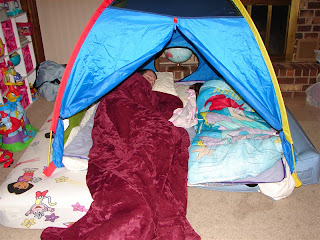 We bought dd a tent for a previous birthday and found that tent camping was overrated. So now it goes up in the playroom sometimes and gets used for a month or so and then comes down. The kids love it. Sometimes dh joins them. Me? I won't give up my bed. I'm too old.